ITBP is recruiting graduates and 10th pass candidates to the posts of Veterinary Officer, Additional Judge General (Commandant), Constable and Inspector (General Duty). 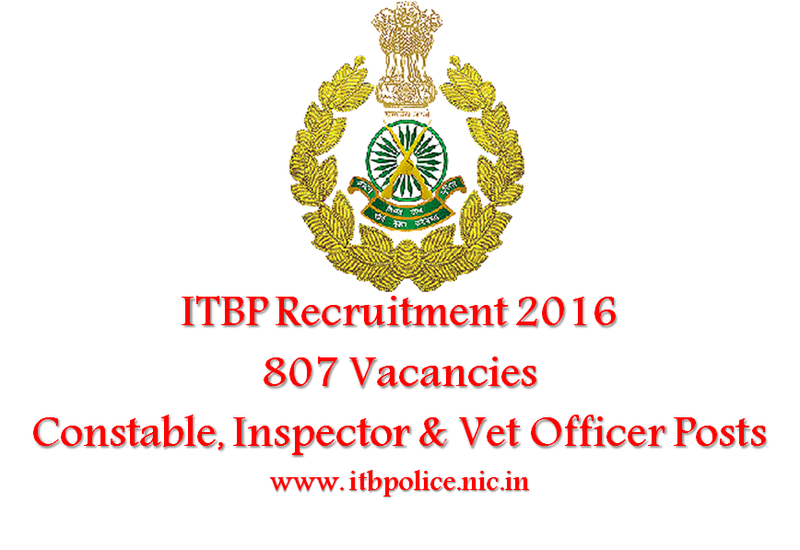 Indo Tibetan Border Police Force / ITBP has announced huge number of vacancies (807 posts). Applications are invited from eligible candidates with minimum qualification of graduation/ 10th pass relevant for different posts. ITBP is one of the five CAPFs of the country, aggressively operating at India’s border with China’s Tibet Autonomous Region. The organization keeps a vigil on the northern borders and fights off illegal violations and immigrations. ITBP announces of vacancies and calls for applications from candidates round the year. This will be a great opportunity for all the candidates who aspire to serve the nation by joining the Army wing. Interested and eligible candidates can find more details in this regard here. 10th pass. Should have represented their University in the inter University Tournaments conducted by inter university sports board.